D-Day Dice is a multiplayer co-op game, where all players play their turn simultaneously and must help each other in order to stay alive. It also includes solitaire optional rules. Although built around dice rolling, this game is about resource management (soldiers, specialists, items and courage) and knowing when to move your unit. Resources are kept from turn to turn, so the players can plan ahead. A finalist in the prestigious game design contest of Boulogne-Billancourt (France) and in the Canadian Board Game Design Contest of 2010. I got the opportunity to play this game several times over and had a blast. The mechanics of the dice rolling is surprisingly well thought out, the tutorial scenarios in the rulebook are quick and easy to follow and the game flows quickly and easily. The components provided with DDay Dice are very well made. Sturdy double sided boards, cards and custom dice. There are not so many pieces that it will make your head spin but there are more than enough to provide variety to each game and allow a number of people to play comfortably. One of the greatest aspects of this game is that it can be played just as easily SOLO as it can COOPERATIVELY in a group. You are not playing against one another, you are playing against the game itself. You either all win, or you all lose. The game itself flows quite easily and with a vast number of “game boards” to choose from with increasing difficulty (from introductory all the way up to insanely difficult) the game will continue to be a challenge as you get better at it. And even then, when it comes to dice rolling games you can only get so good before you have to rely entirely on the dice. The game comes with a very easy to follow series of tutorials that introduce you to all aspects of the game one at a time. This makes figuring out what everything does and how to use it so simple anyone can learn. It also shows you that you do not need to use every rule in the book to play. You can make the game as simple, or as difficult, as you wish by adding more rules and components to suit your needs. 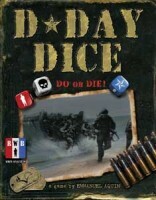 D-Day Dice is a well thought out, well executed dice game playable by as little as ONE person or as many as 4. The rules, components and everything in between are well made and look fantastic. This game is a must have for those looking for a good solo or cooperative game to play that does not take up a huge chunk of time. It makes a great filler game or one that you can play when you have a free 30 minutes to have some fun. Atchung! Schnell! and other war movie staples. We like dice here at WDR and also a bit partial to the odd war game so look what we have here D Day Dice has both yippiee! War Games! Huh! What are they good for… Well actually they can be a lot of fun but equally also a bit complicated involving lots of tables,graphs and bucketfuls of miniatures, so*o D Day Dice, it has a tiny little board and dice and cards, so that makes it all a lot easier. In D Day Dice everyone is on the same side, you play a dicey Tom Hanks and company as you battle your way up heavily defended beachheads and across mountains and coastal defenses to reach the Germans bunker at the top and blow them up and win the game. At first glance the game looks a tad complicated but its really not. Everyone gets their own armies little resource card, it has five spinning dials that you use to keep tally of all the important stuff during the game and is a neat idea. Basically what you are doing is making your way up the beach and gathering resources as you go, these can be either more troops, courage, tool parts or commendations. You get all of this stuff by rolling your lovely lovely dice, everyone gets six red white and blue dice and they have various resources like troops or courage on them, every turn these are rolled giving you your stuff. There’s a player aid that helpfully lists all your actions and also the RWB bonuses you can get by rolling complete sets of the symbols in those colors. Like Yahtzee and just about every game with dice since you get to choose to keep or re-roll some of these dice a couple more times before you go with the total, this moves things into push your luck territory as there are symbols that can lock dice. Each sector of the beach has a defense rating which is the number of troops you are going to lose every turn that you hold that position, there are also other modifiers like Machine Gun nest’s that strafe you DakkaDakka! minefields, barbed wire, and some even require you to have specific equipment or troops. At its core this is a resource management game, you have to balance recruiting cannon fodder so you can survive the withering assault that gets dished out further up the beach whilst also investing in upgrades of equipment or specialist troops, some will open up better routes on the maps. Then its the decision of when to head up the beach, you can wait three turns in most sectors before moving on and this is usually a pretty safe strategy because the later stages of some of maps are grueling death traps. There is a lot going on in this little box, played solo this is an absorbing puzzle to be pondered over, in a group you need to work as a team assaulting those beachheads, trading valuable supplies and knowing when to hold back. This is not a one man assault, if you charge off unprepared leaving the other units behind your going to find yourself getting cut down, and if one unit dies then everyone loses. It works as a co-op but really everyone seem’s to be doing their own thing and someone always seem’s to forget to update the resource card or move their unit dice on, its just a little bit too busy with a lot going on and turns into a chaotic free for all. So what do we think? Well this is the question really I’m kinda hanging on the barbed wire fence, the components are lovely the graphic design fits and is clear and concise. The manual is a tad jumbled and could make things easier, but there some tutorials to enable you getting a grasp of things. The game is a simple thing to teach and play. Now wheres that but… Well but. The set up can drag, considering this is filler territory you have to dig out cards and dice and prepare everything which is a good 5-10 minutes of fiddling about. Then its a half hour blast followed by another ten minutes of break down, not the end of the world but for such a brisk game a lot of its time is spent preparing. As it stands the game is teetering on the brink of greatness but I’d struggle to say where ultimately it fails, it hasn’t enough meat to make it a real strategy game, which is fine but somehow with all the other options in the pot they slow things down too much, leaving it stranded in no mans land. Its not terrible by any means and definitely a lot of fun can be had but most games come down to a book keeping exercise rather than some glorious derring-do, its hard to put my finger on. Its frustrating because I want to like this more than I do. I’ve picked up the Atlantikwall expansion that allows a player to take the place of the opposition so once we’ve given that a spin we’ll see if that gives this the co-op the edge it needs. As its stands this is a great solo puzzler and can be a lot of fun on your own, if you are looking for a co-op then there are better and more fun ones out there. 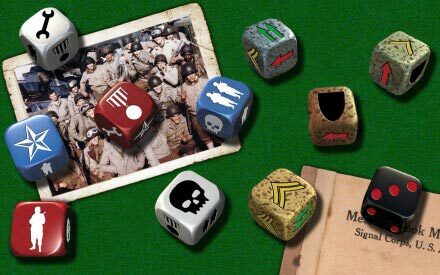 D-Day Dice feels a bit like playing high-stakes Yahtzee; there’s lives riding on rolling the right combinations! I’ve never tried the cooperative mode, but playing solo is a surprisingly rewarding experience, more like playing a video game than most solo experiences. “Passing” a board by beating it is truly satisfying once the difficulty on later locations starts to spike, but the early boards do a solid job of introducing all the mechanics you need. I really enjoy the components here, the custom dice are very nicely done, and the boards feel nice and solid. If you like rolling dice, you need to try it. Add a Review for "D-Day Dice"
4 sets of 6 engraved "resource dice"